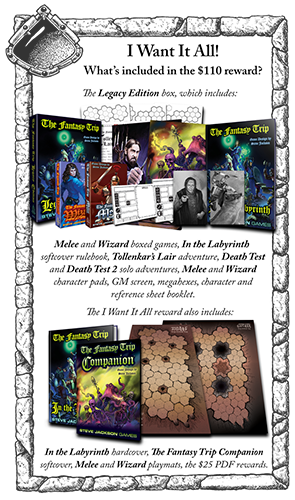 Daily Illuminator: One Week Left For The Fantasy Trip On Kickstarter! August 17, 2018: One Week Left For The Fantasy Trip On Kickstarter! It's stunning. We're absolutely blown away with the support fans have given The Fantasy Trip on Kickstarter, and the campaign still has a week left! We've crested $200,000 and keep climbing; will the dream of $300,000 happen? Only you can help! And the more we fund, the more we can unlock! Steve has already been hard at work posting TFT extras on the site: bonus monsters, additional spells, and even more on the way. TFT Line Editor Guy McLimore is also in the mix, providing his own insight as well. We're so happy that this campaign has struck a chord with our longtime fans waiting for the return, and with the new fans who are looking for a quick and fun RPG experience. We've got a few more surprises up our sleeve, so stay tuned to the Kickstarter, and back today!